Excitedly, the three elves awoke from their slumber the following morning. Clutching their dreams carefully, they delved into their pockets to produce a freshly laundered handkerchief and then delicately placed the dream safely into its folded creases. And so, within minutes the three elves had packed their bags with provisions, clambered upon their unicorns and galloped off towards the Deserts of the Tumbling Weeds, leaving nothing but a trail of dust evaporating into the morning air behind them. It was not long that they reached the Deserts and spied a small figure shuffling lowly through the deep bleached sands. The three elves knew at once it was a lone Sandman, searching through the minute grains, for a selected dream to chisel and hone. They galloped through the rolling tumbleweeds up to him and called out an elven welcome of respected greetings. “Come you, to the Sandman see, hmm?” the small figure squeaked with a friendly mousen reply and he wiggled his long tongue to the three visitors in the traditional welcome that only the Sandman employ. The elves dismounted their unicorn mounts and shifted through the sands towards the small fellow. 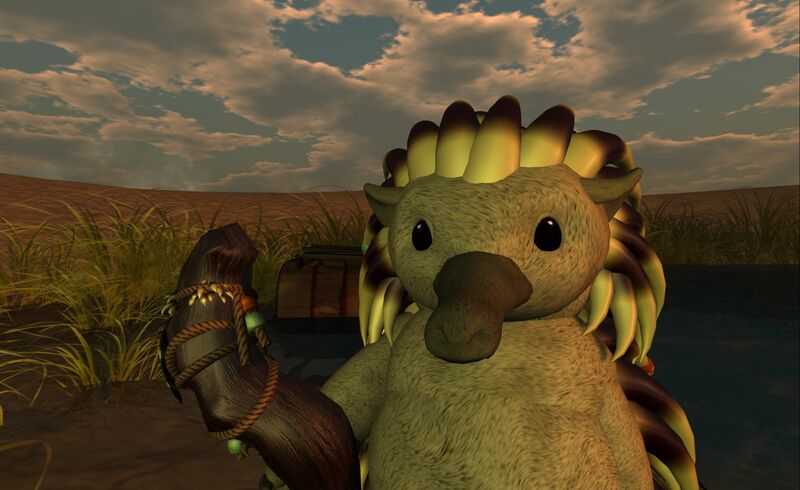 He was much smaller than they had imagined and was covered with a soft spiny back, interlaced with jewels. He had in his hand a grizzled and ancient staff with which he used to help him keep his posture on the sandy footings and he kept his eyes low to the ground as he spoke, still glancing and searching the many grains in his quest for dreams. One-by-one each elf carefully unwrapped their handkerchiefs and delicately held them aloft so that the Sandman could see what lay inside. The three elves nodded in unison and the Sandman spoke to each one in turn, his eyes still distracted from the glints and shines of the multitude of grains that laid upon the ground around their feet. His voice was quiet and his speech was laboured. He spoke to them about great and wondrous adventures that they would have and marvellous things they would see. He spoke of private goals they would achieve and many challenges they would face. He spoke of amazing folk they would meet and new friendships they would form – and all the time, the three elves stood in hushed silence and hungered after his every word. After some time, the Sandman raised his eyes from the ground, looked the three elves squarely to their faces and wiggled his long thin tongue for one last time. “Go then, I must, yes” he uttered to them mousely and he curled into a small ball of raised spines. He dropped to the ground and began to move towards a tangle of tumbleweed that had been caught by the dry desert winds. Then, so swiftly and elegantly, the Sandman rolled himself behind the blowing tumbleweed, using its swirling eddies as a means of reducing the efforts of his own movement, so that he was able to swiftly disappear from their sight in a matter of seconds. Soon, all that was left was the whispering echoes of the winds and the blinding deafness of the emptiness of the open desert’s expanse. The three elves turned and walked back to their waiting unicorns. 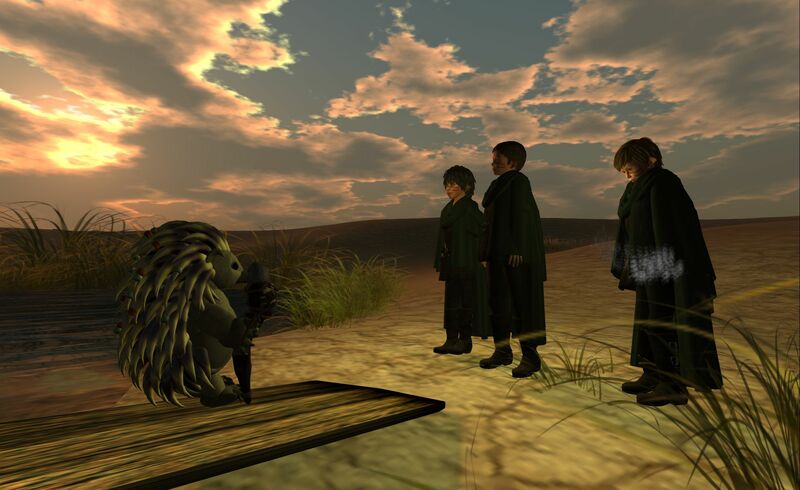 The sun bore down relentlessly upon their backs and the winds nipped their ears with sharp twists – they looked forward to returning back to the sanctuary of their mellowed forest home and the echoes of what they had heard reverberated about their heads in wonderment. It had been an exhausting week; a tiring trek across the whole of Fantasia, the search for mistletoe sprigs and the burning of the Wickerman. The three elves sat around the camp fire and marvelled at what they had done and seen that week. They spent the following short hours laughing, talking and entertaining one another as the mellow springtime night drew stealthily in on hushed footsteps. One by one the elves retired to their tents. Kris, the eldest was soon fast asleep. “Are you asleep yet?” quietly whispered Maxwell to Skippy in the neighbouring tent. But soon the three of them fell fast asleep and continued their fantastical trek into the nighttime world of the DreamTime. The mistletoe was playing it’s Beltane magic in their young minds and soon begun to conjure the most wondrous visions inside their sleeping heads. What can these dreams mean? Of course, as every good elf knows, one should cut a sprig of mistletoe on the day of Beltane in order to dream the annual Beltane Dream. 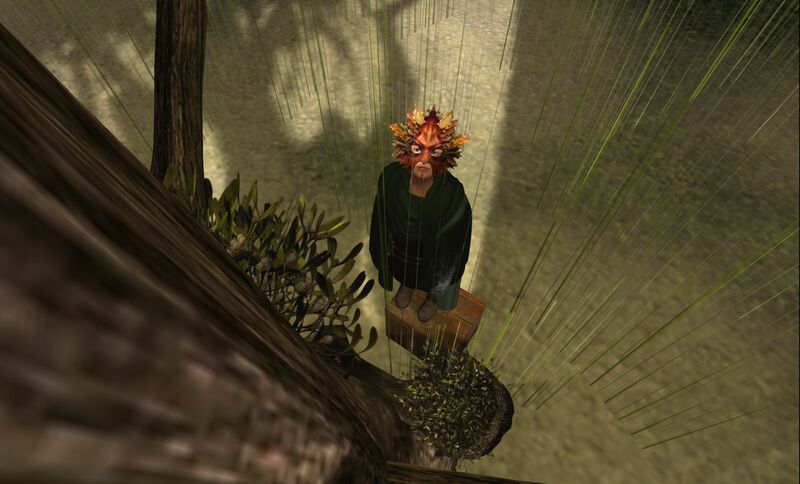 Skippy discovers the mistletoe and stands on a crate to take a sprig. He is determined to realise his Beltane Dream. Even Kris, who is the biggest, has to stand on a box to reach the lower branches. Each of the three elves take a single sprig in order that they can dream the Beltane Dream. After a week-long trek across the whole of Fantasia, Kris, Maxwell and Skippy arrived at the Island of Escapades to join the celebration of Beltane. Once the crowds had gathered, they were led up to the top of Skull Mountain, where a gigantic Wickerman had been constructed upon the remains of an ancient volcano. One-by-one the crowd threw their burning torches into the firewood base and soon the Wickerman was ablaze in the evening sky. As the Wickerman burnt, the crowds sang songs of anticipation of the long summer ahead and dwelt on thoughts of the cold winter past. A few brave souls dared to jump the embers of the fire’s remains and others danced around the base. It was a good Beltane indeed. 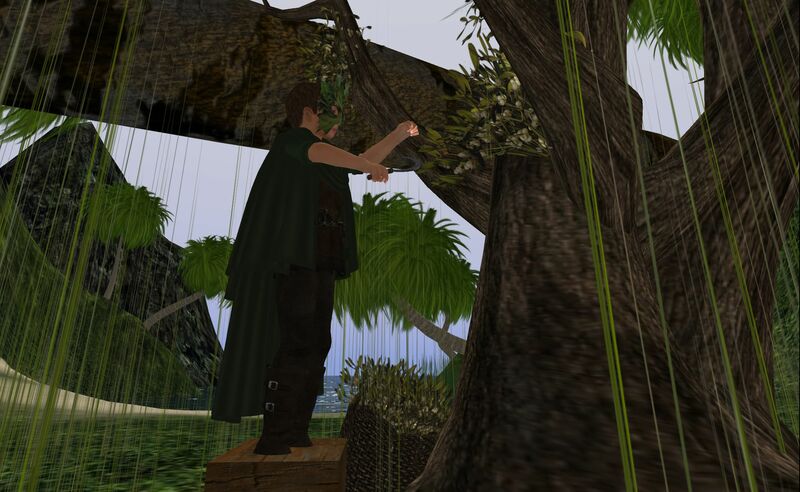 Kris, Maxwell and Skippy seek the blessings of the Green Man before embarking on the annual trek to the Island of Escapades for the Beltane celebration. The crossing of the Swamps of Sadness is always easier if you have overcome the powers of depression in an earlier journey. This time, the elves pass the swamps with no delay. 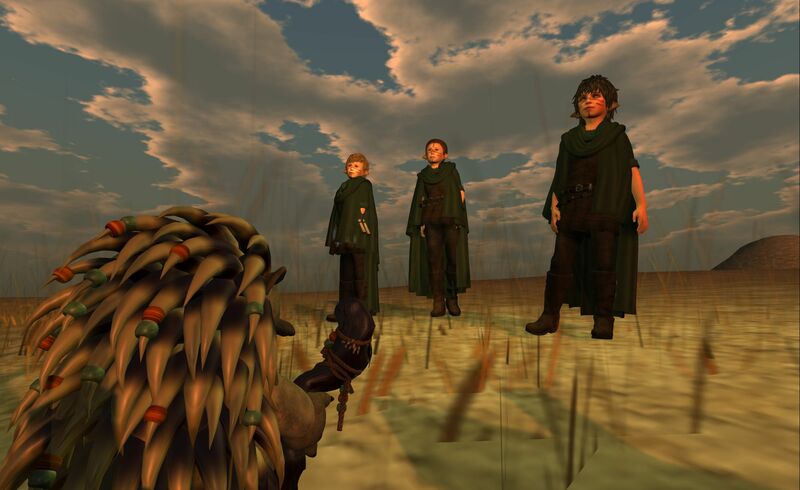 The three elves take a whole day to cross the bridge of the Great North-South Rift. The creation of the Great Rift between the Northern and Southern folk remains such a contentious topic, despite the passing of many thousands upon thousands of years. The trek through the Mountains of the Eternal Moon is always a beautiful one. Despite its name, however, there is no eternal moon: there are simply two moons that are directly opposite each other in the nighttime sky. As one moon sets the other moon rises. 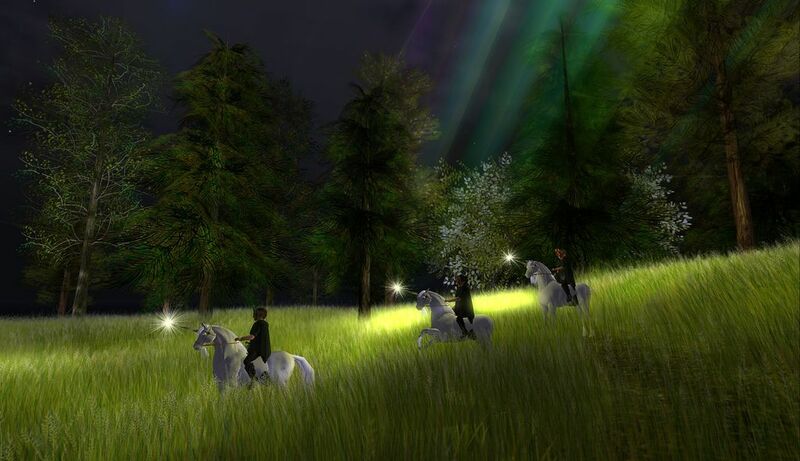 The elves cross the Valley of the Whispering Grass. “Where are you going?” the grasses whisper. The three elves are astute enough to realise that it would be foolhardy to answer each blade if they are to reach the Island of Escapades in time. There are too many strands of grass and not enough hours in the day. Next, they follow the Lotus Flower River. Each lotus flower carries a dream, thrown into the river by the People of the Sandmen, and Skippy spots three special flowers that glimmer in the moonlight. “Spoilers!” whispers Kris as they chuckle and continue on with their trek. 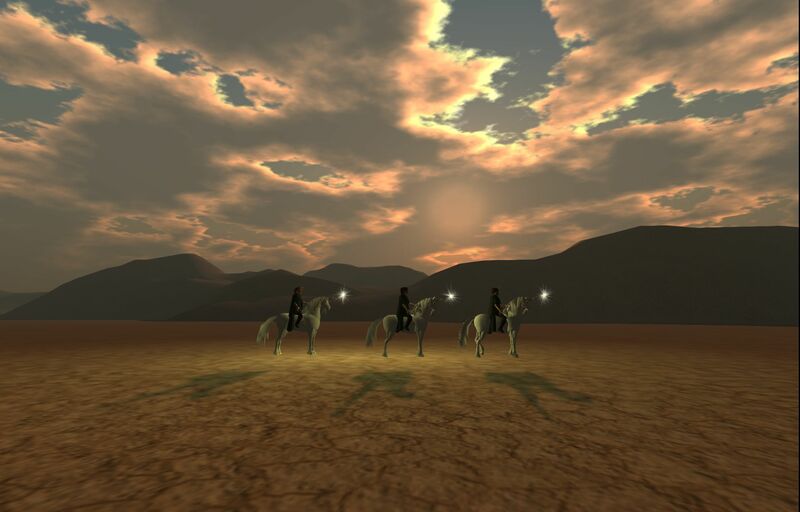 The last part of the trek involves a long march across the Drylands Desert. It is evening before the elves complete the last stage of their epic journey. Tomorrow will be the celebration of Beltane.